With each passing year my bucket list of travel experiences seems to grow at an exponential rate. I’m lucky to have been able to tick a few of them off – my most memorable so far being South Africa, a multi-generational holiday to Disney World Florida and a 40th birthday jaunt to New York. But there are still two things on my bucket list that I simply HAVE to do. The first is to take a family cruise and the second is holidaying in the Caribbean. Who knows, perhaps I’ll kill two birds with one stone and opt for a Caribbean cruise, but first things first, I need to start saving! 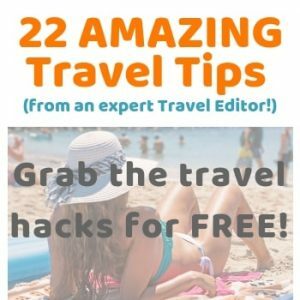 First of all, I like the idea of only unpacking once yet I get the opportunity to see loads of new destinations in one holiday – it’s all about the value for money! As a family we love taking part in adventure and activities; cruise ships offer a plethora of experiences and activities for kids of all ages – and then there’s the added advantage of being able to take shore excursions to really get to know a destination. A fair few years ago you’d be forgiven for assuming that cruising was for the over 55s and, let’s be honest, you wouldn’t be far off the mark. But what’s really interesting is that over the last decade or so, the cruise industry has seen massive changes, fuelled by demand from people like us – families with dependents, along with younger couples, newlyweds and even groups. 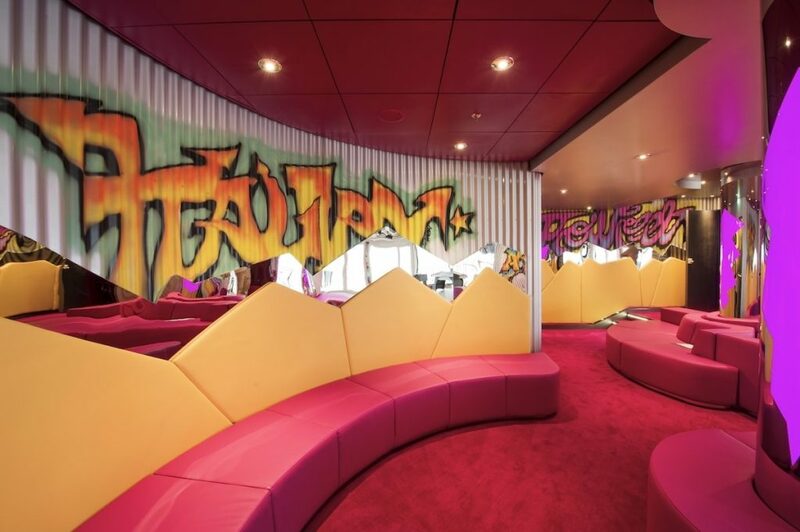 This has meant that cruise lines have had to evolve quite rapidly – and they’ve certainly risen to the challenge, offering anything from rock-climbing walls to surf simulators and everything in between. You may have heard of modern day cruise lines being referred to as ‘floating cities’ – and it’s not an exaggeration – they really do exist. 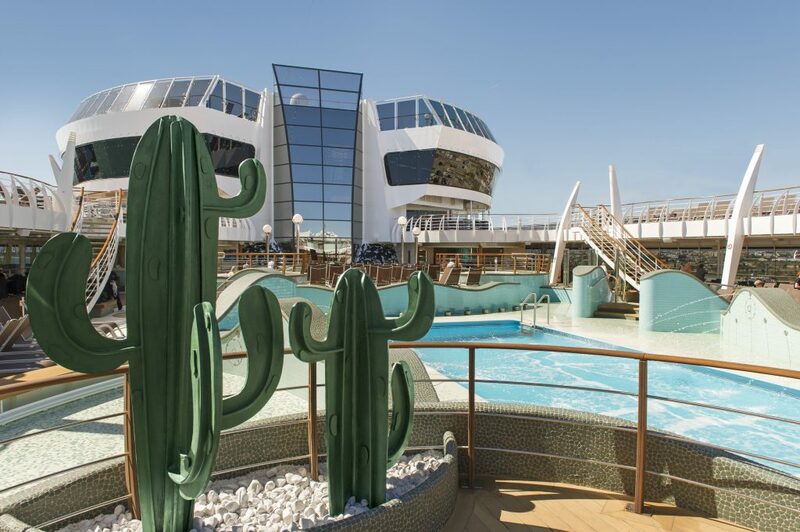 Take MSC Cruises as an example – each ship in the fleet is different and offers a variety of facilities but all of them feature all or most of the following: Mini bowling, power walking track, squash, shuffleboard, football, basketball, jogging track, mini golf….and that’s just for starters. 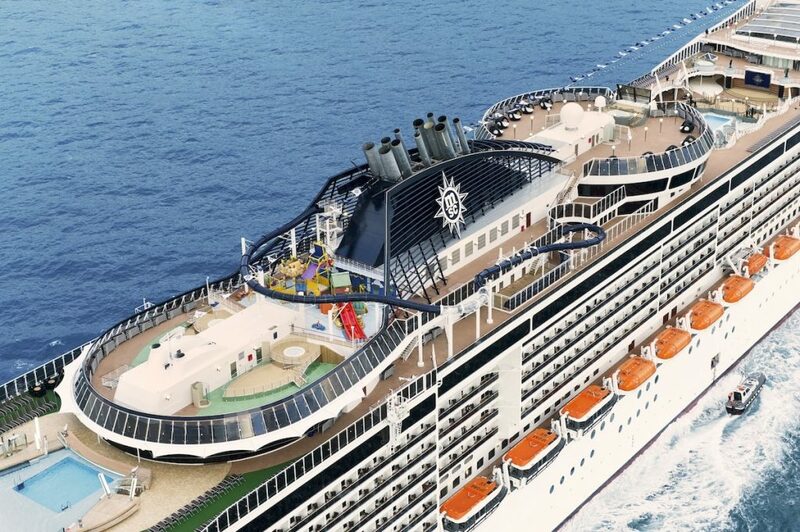 I also need to mention the ship’s aqua park as well as the longest single-rider slide of all cruise lines. Can you imagine how worn out the kids would be at the end of the day from all the activities? Imagine putting the kids to sleep and they go out like a light, giving us parents time to chill out and have some much needed ‘me time’. Now that would be something. 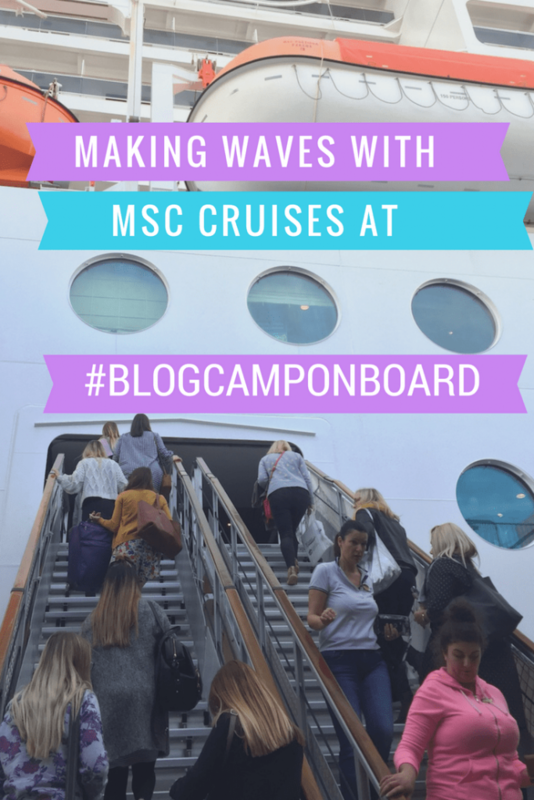 There’s a reason I picked MSC Cruises as my example because just a few weeks ago I was invited to a blogging event called #BlogCampOnBoard and it took place on board MSC Preziosa in Southampton. 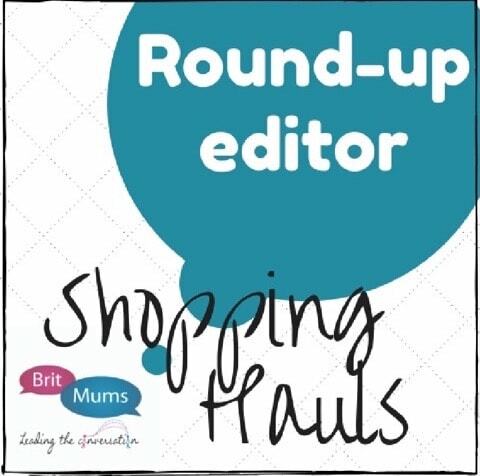 It was organised by the very talented (and super helpful) Sally Whittle, founder of the Tots100, Trips100, Foodies100 and HIBS100 communities, along with the MAD Blog Awards. Phew – I don’t know how Sally does it all! 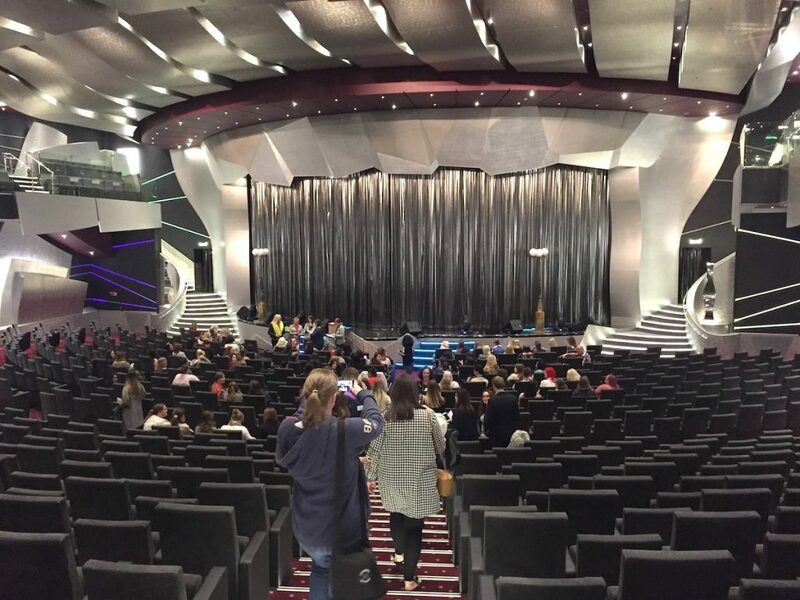 When I heard that the event was to be on a cruise ship – and one that seemingly catered well for families – I had to check it out (in the name of research of course). This was going to be one hell of an interesting day – blog learning and a snoop around an MSC ship? Aye aye captain! The schedule for the day looked pretty straightforward. Around 120 of us bloggers would meet at the terminal at 9.30am, ready for boarding at around 10am-ish. It was quite amusing listening to my fellow bloggers speculating about what the day would be like, with some even believing that we would were going on a mini cruise out to sea! Mind you, given the level of security, you’d think we were off on a week’s cruise somewhere, but alas we remained moored at Southampton. But it was reassuring to see that safety is obviously taken very seriously. First we were taken into the Platinum Theatre (a huge auditorium), where Sally appeared on stage to say a few words. We were then presented with a video snapshot of what kids are offered when they cruise with MSC, along with some general information on what families can expect. This was followed by musical games, which was highly amusing to watch – I’m just glad I didn’t volunteer myself as I’m useless at my musical knowledge (unless it’s hip hop/rap songs and then I come into my own). 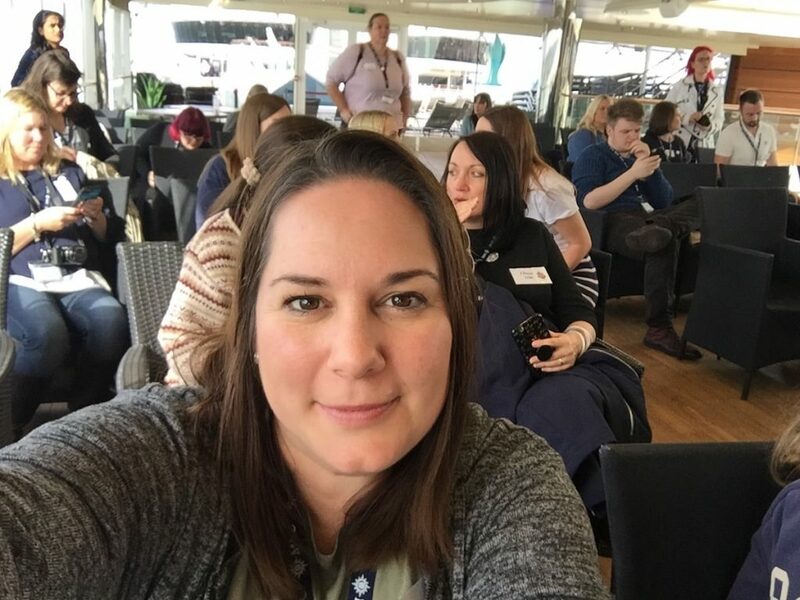 We were then split into three groups to commence with activities followed by a delectable lunch, then a third activity, before a final get-together to learn about blog metrics from Sally and take part in a Q&A session with the UK managing director of MSC Cruises and his team. The MSC team offered a real insight into how it catered for families and I was pleasantly surprised to hear that it wasn’t just toddlers who were provided for; the company also takes into account families like myself with teens and tweens. 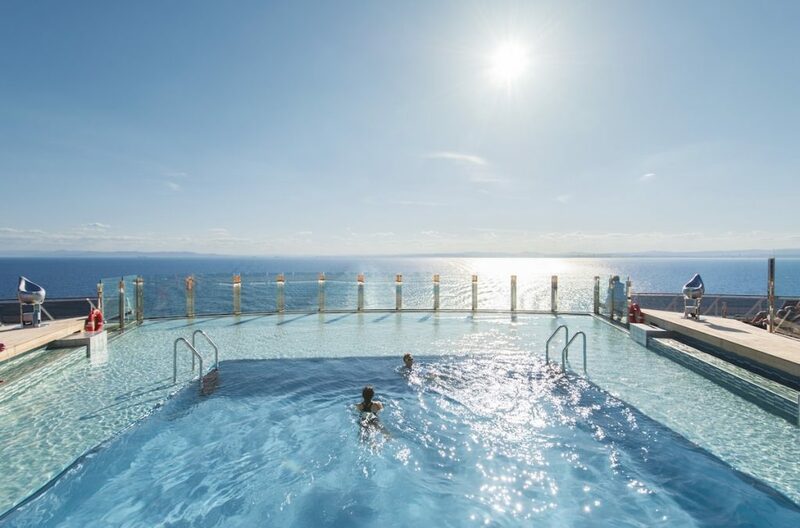 This is incredibly important; trying to convince a 10 and 12-year old that a cruise is a great idea for a family holiday is made a hell of a lot easier when you can tell them they have specific clubs and activities to cater to their needs. A Baby club for kids younger than 3 years. What’s more, clubs are open daily from 9am-11pm, are free for families to use (except the Baby club where special provision is needed of course) and all include breakfast, lunch and dinner. 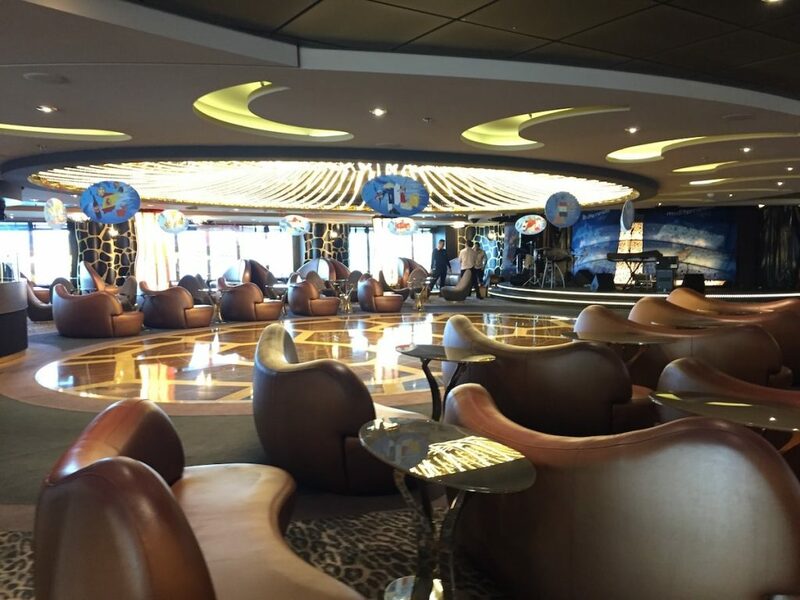 What I was particularly impressed with was the way the cruise line appears to take a proactive approach when catering for kids – and tries to overcome any issues that they might face. A case in point – MSC welcomes 200,000 kids from 35 different nationalities; given that these kids come together in the various clubs to play together, MSC decided that it needed to offer a way for children to communicate more effectively with each other and overcome language barriers. So it went and teamed up with LEGO to introduce an event tour – and we all know that you don’t need to speak the same language to appreciate LEGO and bond over it too. Another way MSC is empowering kids is to give them the opportunity to become brand ambassadors of UNICEF – and they even receive a certificate after their cruise to confirm their ambassador status – now that’s kid power! So as you can see, there’s plenty to entertain families and encourage them to spend more quality family time together on board. But for me, perhaps the most impressive development was the launch of a YouTube channel called Kelly and Kloe On Board. The company has actually gone one better – and allows young cruise guests the chance to become the stars of the web series. I know for one that my kids can’t keep off YouTube; in fact, they actually prefer watching and making YouTube videos than watching regular TV, so the chance to become part of a video show would really appeal to them. And we all know that happy kids = happy (and relaxed) parents. Following the chat on MSC’s family offering, we were all split into three separate groups to take part in different activities. I was in group A to do the ship tour and we had a brief guided tour that took in the casino and the Atrium, with its AMAZING sparkling grand staircases. 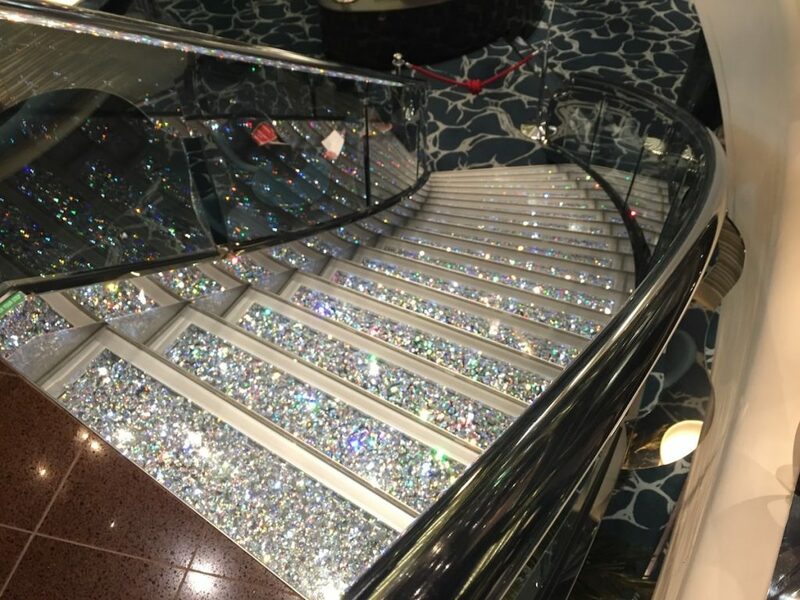 I think most of us bloggers were wowed with the sparkles on the staircases – especially when we were told the steps were made from Swarovski crystals and that each was worth between 8,000-10,000 euros. They must have cameras permanently fixed on those staircases to look out for people trying their luck with a hammer! Made of Swarovski crystals, each step is worth 8-10,000 euros! Other venues we visited on the tour included the Safari Lounge (suitably named given its décor), the Art Gallery, followed by the Sports and Bowling room. With 18 decks on MSC Preziosa, we only saw a fraction of the ship, but what I did see was very impressive. I also discovered that Preziosa offers a huge selection of Mediterranean itineraries, calling at ports throughout France Italy and Portugal. And the great news is that prices for kids start from a very affordable £99. Other ‘sweeten the deal’ offers include free car parking and free balcony upgrades. After the tour it was time to watch a hair and make-up demo. I have to be honest, not being a beauty blogger, I thought it wasn’t going to be my scene, but as well as the demo, we found out about the different types of spa treatments and services offered – and spa treatments is something that I could become very accustomed to. Chilling out on board and ready to learn! By this time it was coming up to lunchtime and we hadn’t yet had the chance to have a drink. If I were to do it all again, I’d make sure I had a flask of tea and some biscuits with me; if I’m dehydrated or if I skip a meal (I missed breakfast), it tends to spark off a migraine. And unfortunately for me that’s what I ended up getting. So much so, I remember trying to drive home that night and ending up stopping in Cobham to be sick and have a lie down in the back of the car – not my finest moment I have to say. I digress. Lunch was lovely and we were given the option of a buffet lunch or to order off the menu. I ordered from the menu and the food was delicious. And now for the confession: I went and helped myself to a second dessert from the buffet and that too was delicious. Well, I do have a very sweet tooth! And besides, in the name of research I had to try both options to see if they catered well for kids. And they did; I know food-wise I wouldn’t have a problem with my two young fussy eaters. After lunch we were given the option to either (a) have a ship tour (b) go to a food photography session or (c) Listen to a session on Podcasting with Alison Perry – who I had met the previous week at BritMums. As I had done the ship tour I chose Alison’s session as I had toyed with the idea of launching a podcast a while back, but after listening to the session, I decided that perhaps it’s not for me just yet given both the time and financial sacrifices that it takes to get one up and running. I haven’t discounted it entirely one – it might be one for the future. 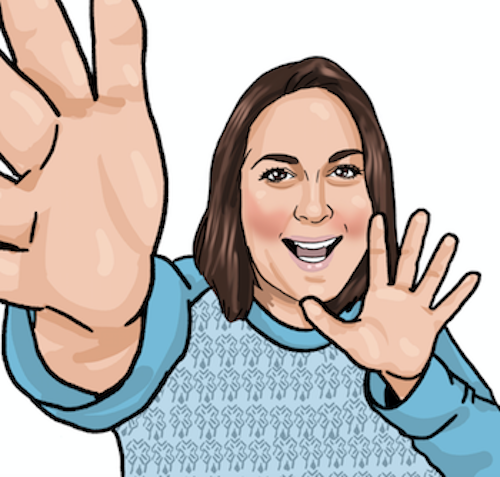 But if you’re serious about podcasting then Alison had some great tips – and I took some handy notes if you fancy a read – you can download it here for free. Finally, it was time for the last session of the day – metrics! 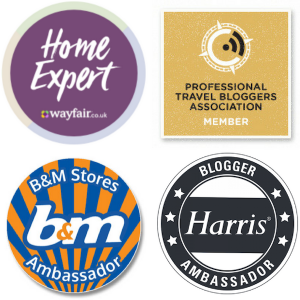 You see, the communities that Sally initially set up (Tots100, Trips100, Foodies100 and HIBS100) measure our blogs’ reach and our influence and give us a scoring; it’s this scoring which determines where we rank as an influencer – and, as I was soon to discover, there are plenty of factors (eight in total) that come into play when determining how blogs are ranked. The factors include page impressions, unique visitors, SEM Rush, Instagram followers, Twitter followers, Klout Score, Page Authority and YouTube views. Sally also gave us a great insight on what is acceptable as prizes for bloggers to promote if they ask for followers. For example, you can’t give away money vouchers or things like Amazon vouchers in return for a ‘follow’, as this is seen as buying followers, which ranks against you. 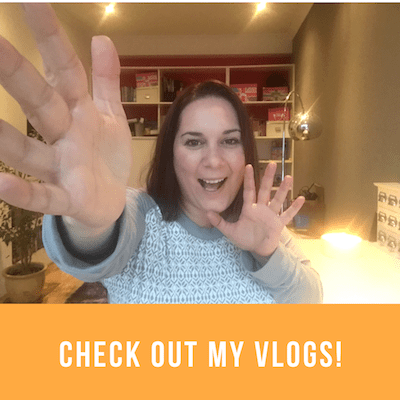 I’m just glad that I didn’t put a foot wrong there and instead opted for more traditional giveaways on my blog – that could have been a close call! If you’re looking to boost your ranking, the best thing is to focus on orginal content that fits my niche. Finally, the big boss himself – the managing director UK & Ireland of MSC Cruises, Antonio Paradiso, made a star appearance to offer us more information on the cruise line and its fleet of ships, plus answer our questions – which mostly revolved around how they catered for families – and those with special needs. 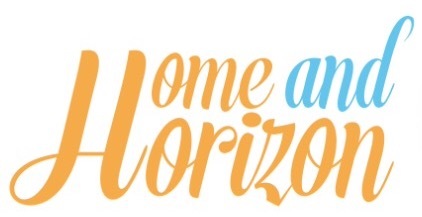 So what’s on the horizon for MSC? The cruise line currently offers 13 ships and is scheduled to offer a further ten ships within the next nine years. And the new ships look to be getting bigger – both in terms of size and the variety of options available to different types of cruise-goers. One aspect that I picked up on was the value that cruising offers. Nowhere are you able to do so many activities and see so many destinations as on a cruise. You can see why it has always appealed to me. I even discovered that some of the newer ships have formed partnerships with one of my fave shows, Cirque Du Soleil; I’ve been to three Cirque Du Soleil shows now and they always amaze me. MSC Preziosa (see the virtual tour) offers cruises from Southampton, and from next year, Magnifica (meaning Magnificent – and I’m sure it will be), will also be joining her, meaning that it's even easier to take a cruise from the UK. Plus, departures from Southampton include free parking worth up to £120 – a win-win. More good news is that MSC has recognised Brits’ obsession with tea drinking – and will be providing kettles in cabins – hallelujah! And they've also teamed up with my favourite brand of tea – Yorkshire Tea! A little detail like that means a big deal for an obsessive tea-drinker like me. The recently refurbished Magnifica will be operating Northern Europe and Mediterranean itineraries including destinations such as Italy, France and Spain and the ship features (amongst other things) five gourmet restaurants, 12 bars, five kids’ and teens clubs with themed venues, a spa offering traditional Balinese massages and beauty treatments, a sauna, Turkish bath, fitness centre, thalassotherapy room and relaxation area. Anyway, don’t just take my word, have a go of the virtual tour on board! Finally, there are still a lot of misconceptions about cruising – not just the ‘it’s only for old people’ belief, but also ones regarding safety and whether or not it’s suitable for families. Cruising is ideal for people of all ages as it caters for all ages. It’s also very safe; kids can’t climb over the edge and fall into the sea (which was one parent’s anguish I overheard) – the sides of the ships are too high to climb and the decks are tiered, meaning that even if they got some sort of step ladder, they’d be landing on the deck below. Plus if you’re worried about kids getting lost, some of MSC’s newer ships are introduced geo-locating bracelets so parents can pinpoint where their little treasures are. Oh, and after a bit of digging, I also discovered that MSC has developed the industry’s first ‘man overboard’ technology with a video surveillance system that is now operational on MSC Meraviglia. Over time, the system will be introduced across the fleet. Pretty cool. Where else can you visit five or six different destinations in a week or ten days – and only unpack once?! I’m game. You don’t have to fly somewhere to get onboard, with many sailings offered from the UK! So, going back to ‘Preziosa’, it’s a fitting name given that you and your family could be making ‘Precious’ memories together. 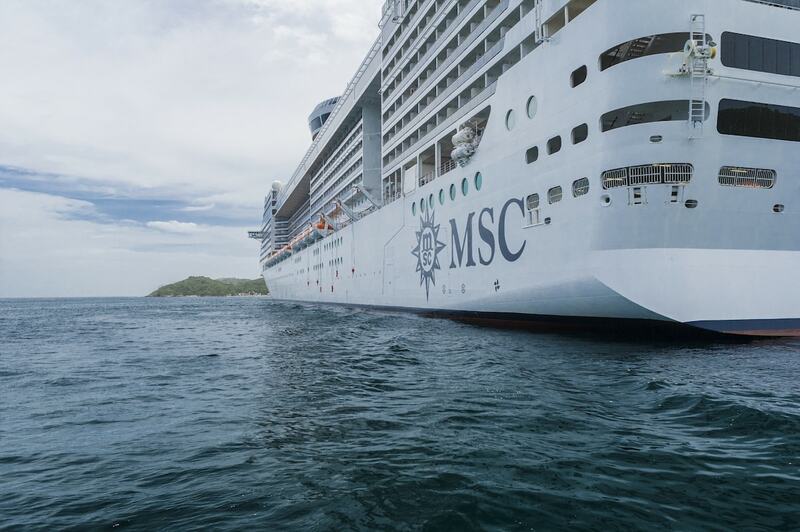 And now that I’ve spent a day with MSC I know that a cruise holiday will remain firmly on my bucket list; now just to convince the kids – although after I point out what they can get up to on board I have a feeling it might make the top of their bucket list too. What a brilliant write-up of the whole day. I’m so sorry you ended up feeling unwell – I think we bloggers all rushed past the water station in the terminal to get on board and then there wasn’t anything until lunch! Lesson definitely learned for next time, though 🙂 Thanks again for joining us, and for sharing your experience of the day. Thanks Lucy – sorry to hear about that…I also get sea sick but I’ve heard people say because the ships are so big you don’t feel the waves as much and you’re less likely to feel sick. Well said Sanna- and very true. Let’s hope more people are open to giving cruising a go so they can see just what it offers. This looks like an amazing thing to do, I have never been on a cruise. But this looks like a lovely idea, I always worry there wouldn’t be much to do, however this one looks like it’s got it all! 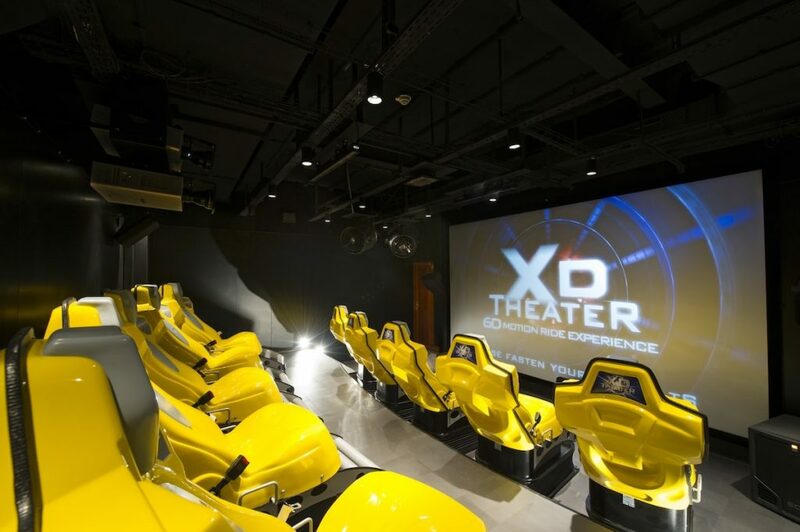 I like the 4D experience. Fingers crossed you’ll get the chance! I’m gutted that I wasn’t able to make it, but it looks like it was a wonderful event. The ship looks amazing! I’ve never been on a cruise ship before, but I’m hoping to go on one this year. It sounds fun! Best of luck – and have an amazing time if you do! I’ve visited a cruise ship but never had the experience of a holiday on one yet. It has been a lifelong dream of mine and one day I hope it comes true. Your account is a really good insight into what to expect. I’m excited! Those cruise ships are so huge – like a complete city in one. I’m really not sure if they’re for me though. I haven’t been on one, but I like to spend time in each port of call, a few days spent wondering around a city to soak up the culture and history. Me too Charli – I think a few of them do offer overnights in ports – and some even allow you to stay in a hotel in the city overnight so you’re in the thick of things…great news is the cruise lines continue to develop and meet with the public’s demands.. I have been on a few cruises but this ship really looks incredible. It’s massive and it looks like it really has something for everyone. So glad you had a great day out! Thanks very much Emma – great to hear you’ve been on a few cruises already – I’m sure they were great? Elizabeth recently posted…Win a Thanksgiving Giveaway Bundle with OXO UK! Ooh – that’s fantastic news – I’m sure you are so excited and will love it! Make the most of it! Thanks Hannah! It’s wonderful – what I wouldn’t give to head out to sea on a wonderful holiday….one day! Cruise ships have always amazed me a bit- they’re enormous and they fit absolutely everything you could possibly want on board. I definitely want to try it at least once in my life! I’m not sure how I feel about cruises. They look amazing, but then they look like moving cities and I’m not too keen on the stationary ones! However, this looks like another world. 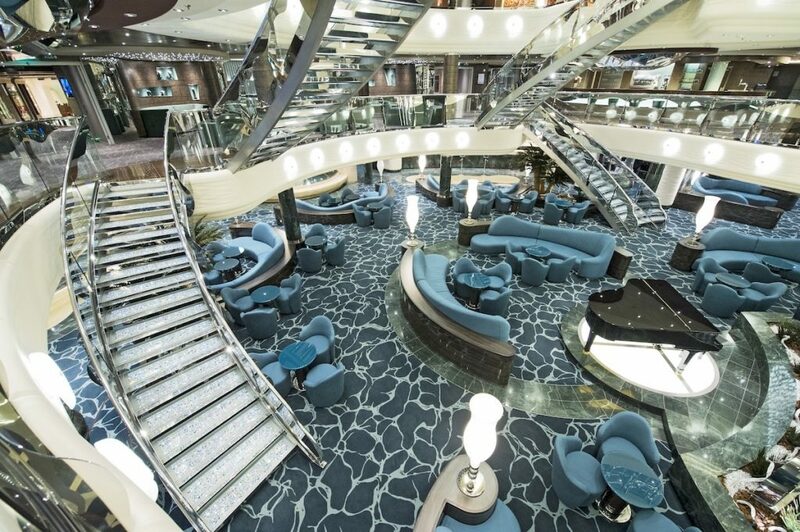 It feels like you’re in some grand hotel rather than a big ship – it’s lovely. Ah it was great to meet you too Rebecca! And you were a great inspiration! Thanks for taking my 20 questions at lunch! Ah, I lived in Southampton for many years during university and as a native Londoner, I was always in awe of the cruise ships that came into the docks. I’ve always said that I wouldn’t really like to go on a cruise, but then I was offered the opportunity to look around one for a day and I may have changed my mind… there’s just so much to do! Thanks Leigh – I think you’ve hit the nail on the head…unless you’ve stepped onboard a cruise ship it’s impossible to say it’s not for you. Some of the features and facilities on board are amazing.